Are your tired, overworked joints taking all the fun out of your life? Normal aging, combined with years of repetitive motion and stress, take a real toll on your joints. You feel stiff, uncomfortable… old. Even simple things like standing, bending over, or walking cause you increasing discomfort. Move 360™ Advanced Joint Support delivers a powerhouse combination of natural joint-health ingredients, including 100% Eggshell Membrane, Turmeric Extract, White Willow, and Boswellia Serrata Extract. Together, these compounds give your joints some much-needed TLC — so you can get back to doing the things you love… without paying a price for it later. So you can experience a richer, more active life, free from the discomfort caused by aging, overworked joints — and start enjoying the life you deserve! White Willow has been used for more than 2,000 years as a natural solution for joint irritation and discomfort. Boswellia Serrata promotes healthier cartilage, which reduces discomfort and supports better mobility. Turmeric is rich in curcumin, which has been to shown to promote better overall joint health and comfort. Piperine, an extract derived from black pepper, dramatically improves your body’s ability to absorb curcumin and the other joint-health compounds. Natural eggshell membrane has been shown to improve joint health and mobility. Take 2 capsules daily on an empty stomach, preferably first thing in the morning. If you’re not 100% satisfied with your results, send back your order within 90 days for a full refund — no questions asked. You will be absolutely amazed at just how quickly your body can change. 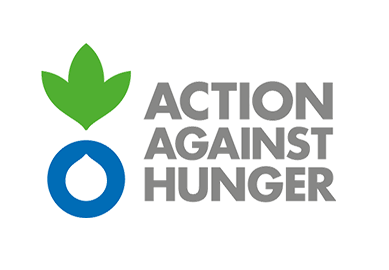 See the results for yourself…. How does Move 360™ Advanced Joint Support work? Move 360™ Advanced Joint Support contains natural eggshell membrane, a breakthrough in joint health that contains both glucosamine and chondroitin — two essential molecules for proper joint function. The revolutionary combination of turmeric, boswellia serrata extract, and white willow has been shown to reduce irritation and discomfort associated with overworked or aging joints. And piperine (an extract of black pepper) ensures optimal absorption of all these joint-health compounds. The majority of our customers enjoy taking advantage of the discounted 3-bottle option. Not only will it save you money, but once you begin to experience improved, more comfortable joint health, you won’t want to interrupt your progress. For those who plan to share with their families, I recommend investing in the even lower discounted 6-bottle option. 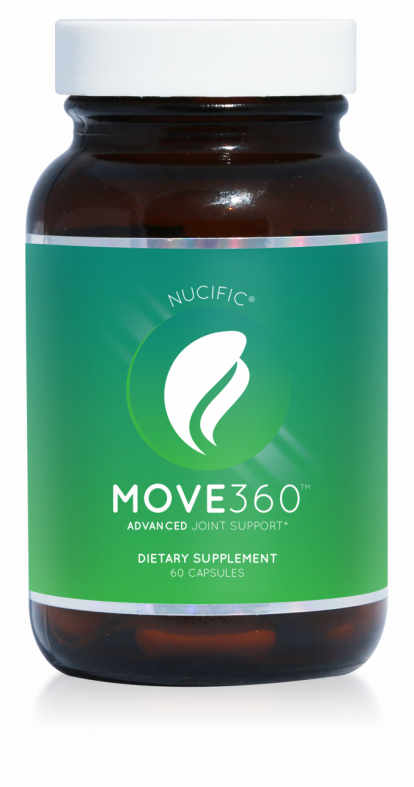 What is in Nucific’s Move 360™ Advanced Joint Support? 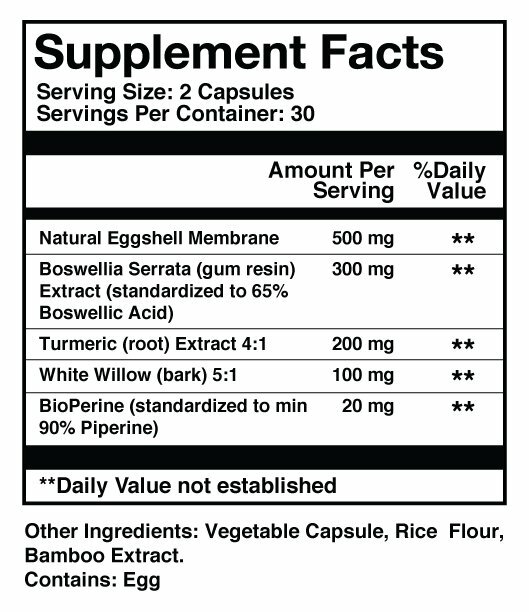 Move 360™ Advanced Joint Support contains natural eggshell membrane, white willow, turmeric, black pepper extract for absorption, and Boswellia Serrata extract — a natural compound that helps reduce irritation and discomfort, and helps prevent the breakdown of connective tissue. How do I take Move 360™ Advanced Joint Support? The recommended dose is 2 capsules daily, on an empty stomach. To ensure that you don’t miss a dose, we suggest you take them first thing in the morning, before you eat anything. Has eggshell membrane been studied? Yes, in multiple double-blind, randomized, placebo-controlled studies. The results were statistically significant, and participants experienced decreased joint discomfort and stiffness. Why should I choose Nucific Move 360™ Advanced Joint Support instead of other products on the market? Our product is based on the most cutting-edge and revolutionary joint health studies. We took all the best and most effective active ingredients on the market and put them into one capsule. And in order to get enough of each ingredient in each capsule, we use extracts instead of bulky powder. Now you can have five different joint supplements in one capsule. We’re 100% confident in our product, and as always, it comes with our 90-day money-back guarantee. Is Move 360™ Advanced Joint Support safe? Move 360™ Advanced Joint Support is generally considered safe. 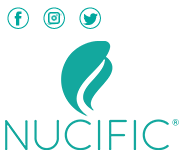 At Nucific, we wouldn’t release any product that wasn’t considered safe. However, we always recommend consulting your doctor or medical supervisor prior to taking any new supplement or medication. Everything in Move 360™ Advanced Joint Support is 100% natural. Will Move 360™ Advanced Joint Support really work for me? Everyone’s body is different, but clinical studies have shown that the active ingredients in Move 360™ Advanced Joint Support have outstanding effects on joint health, discomfort, and movement. Participants in the double-blind study reported seeing results in as little as 2-10 days. Aug 26 2018 This product works great! Aug 6 2018 It works! !